To see the latest innovations from TaylorMade, please visit our TaylorMade drivers page. 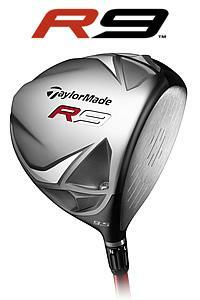 TaylorMade's newest club for the 2009 season is the TaylorMade R9 Driver. This driver truly is a new revolution in the golf driver category. The R9 utilizes TaylorMade’s legendary Movable Weight Technology (MWT) that was first introduced with their r7 metalwood product line. MWT allows players to change the clubs' center of gravity by moving weight in different places to suit different launch conditions. Like the r7, the R9 has MWT, but it also introduces a brand new feature named Flight Control Technology (FCT). FCT gives the player the ability to adjust the loft, lie and face angle of the club. The club head can be rotated into one of 8 positions, giving the ability to adjust from two degrees closed to two degrees open. The actual measured face angle will be square to four open, though visually, four open looks two open to the golfer. MWT and FCT work together to give 75 yards of left to right adjustability, three degrees of launch angle adjustability and up to 1800 rpm of spin adjustability. Along with the new advancements in design, the R9 features the new Fujikura Motore shaft with High Inertia Tip (HIT) technology. This shaft will help players produce faster ball speeds and more stability on mis-hits. All of these technological advancements truly make this driver the most advanced in the history of TaylorMade. The R9 has already won a PGA event in its first week out on tour. That is something that has never been done by any previous TaylorMade Driver model. The R9 combines modern and classic lines to create a "New Classic" head shape that will satisfy players of all types. The club has a large address, and is described as a combination of the r7 SuperQuad and r7 Limited (a triangular shape with contoured corners) head shape design. TP shafts will be offered at a upgrade price. Shafts available will be from Fujikura, Matrix, Aldila and Mitsubishi. There is no difference in the head between the TP and non TP versions. The driver will not have any TP graphics on the head. Only the shaft upgrade makes up the difference. The R9's innovative features create an unprecedented amount of options for optimum performance. Being able to change and utilize these features truly makes the R9 driver suitable for all types of players, from touring professionals to high-handicappers.